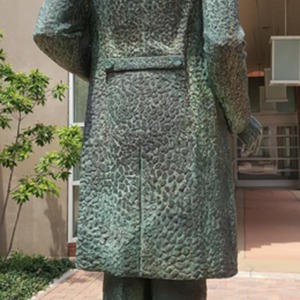 Portrait of former mayor Tom L. Johnson shown standing with one hand in his pocket and the other gesturing in speech. He is dressed in 19th century clothing, with an overcoat, bowler hat, and vest. 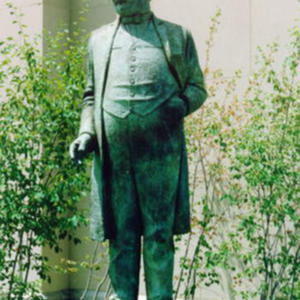 Johnson was the mayor of Cleveland from 1901 to 1909. During that time he completely transformed the city into the industrial kingpin it was during the early 20th century. 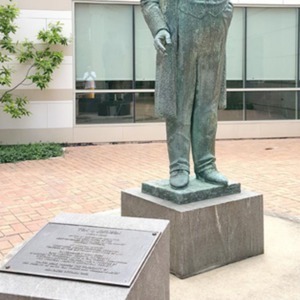 Lauded as a consummate "municipal technician" , Johnson paved hundreds of miles of new streets, installed new parks, built numerous public facilities, sporting centers, playgrounds, etc. He also began work on the West Side Market that still operates today as a landmark food market in the US. 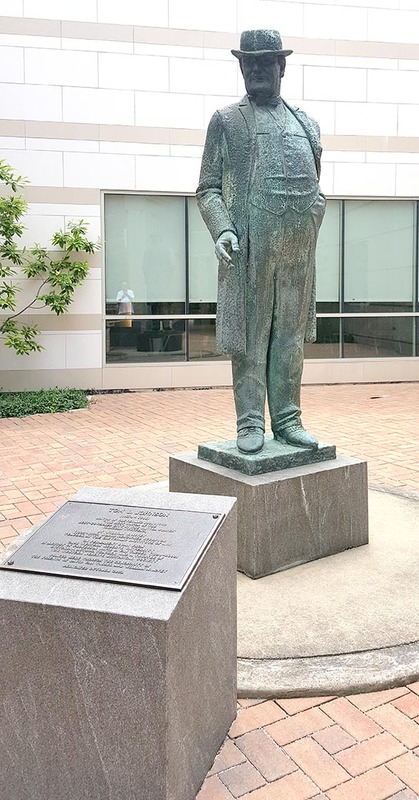 Johnson was instrumental in incorporating electricity, public transit, steel, and a number of other infrastructure items into the city's economy. 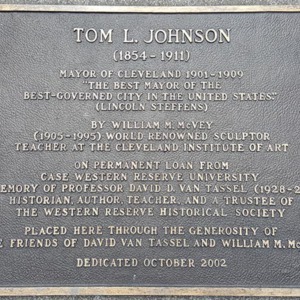 Without Tom Johnson, it is safe to say that the Cleveland of today would be a much smaller, very different city. 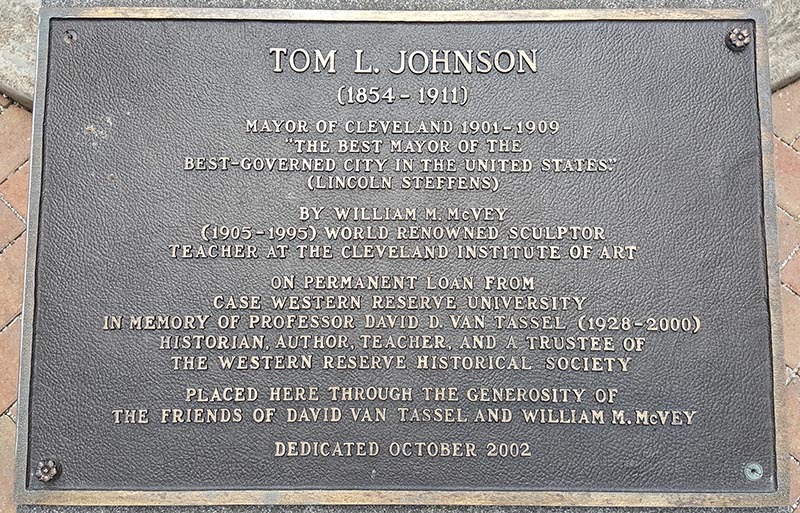 : William M. McVey, “Tom Johnson Monument,” Ohio Outdoor Sculpture Inventory, accessed April 22, 2019, http://oosi.sculpturecenter.org/items/show/141. 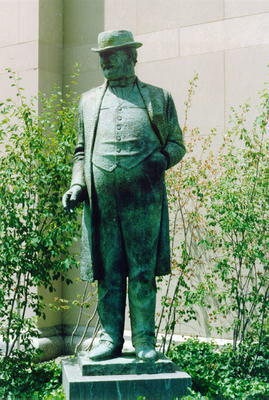 Removed from Freiberger Field in 1996 and stored until Spring 2002 installation at WRHS.